Good morning, here’s your serving of Brekkie Bites for Monday, October 29. We covered the first of the weekend’s two big races, Chattajack, in yesterday’s Brekkie Bites, so let’s focus on the Frenchies this morning. Martin Vitry and Amandine Chazot claimed the distance portion of the French Nationals on Sunday. Or at least, this weekend’s French Nationals. The duo saluted in the 14ft National Titles held in Hossegor, however they’ll have to back it up in next week’s 12’6 Nationals (yes, it’s confusing) to cement a spot on Team France for the Worlds in China (or at least I think that’s how it works). 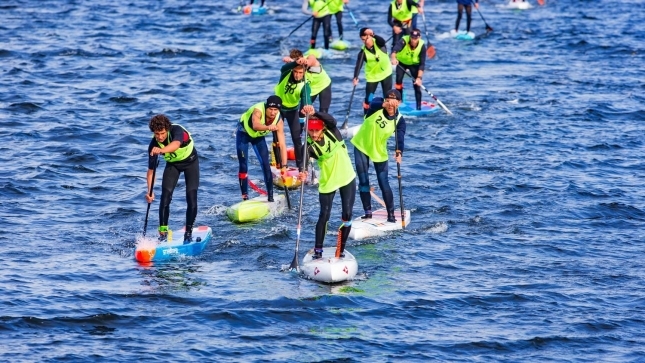 Martin narrowly held off Tom Auber and world number five Noic Garioud after just over an hour of paddling, while Amandine was too strong for Fanny Tessier and Melanie Lafenetre. On Saturday it was the beach race (a way cooler name for the standard old “technical course race”), where Tom Auber saluted ahead of the very impressive junior whipper-snappers (and names to watch) Jules Langlois and Gabi Bachelet. France’s well-known internationals Titouan Puyo and Arthur Arutkin (along with Olivia Piana) sat out this weekend’s event. Amandine picked up the women’s beach race title to setup her clean sweep of the weekend. Here are top finishers. More shots on the French Surfing Federation Facebook. Looking for our coverage of the epic Chattajack ultra in Tennessee? Hit yesterday’s Brekkie Bites for the bite-sized summary. And check back tomorrow morning for another serving of news from the international world of stand up paddleboarding.